"The Bedeviled Heart" is the ROMANCE SILVER MEDAL WINNER of the Independent Publisher Book Awards! Cameron Malcolm Stewart, Earl of Lennox, had made his peace with destiny. It was not his fate to love as other men. Each of his politically arranged marriages had ended in disaster. And though he had never touched a one of his wives, he had come to believe that sharing his name would consign a woman to an early grave. So, on the sunny spring day Cameron encounters a delightfully devious, bright-eyed lass selling charmed stones in one of Stirling's alehouses, he tosses her a shilling, thinking only to steal a kiss. But it is a kiss that will change his life forever. To care for her ailing father, the precocious Kate Ferguson has resorted to swindling the drunkards of Stirling. But a chance meeting with a handsome and seductively mysterious outlaw named Cameron ends with a kiss that changes the course of her destiny. But as dark times descend upon Scotland, Kate is inadvertently caught in a deadly web of court intrigue spun by the royal favorite, Thomas Cochrane. And as King James III falls prey to his fear of the Black Arts, accusations of witchcraft and treachery abound. The fate of Scotland hangs in the balance, and while Cameron vows to defy destiny itself to hold Kate forever in his arms, he must unravel the plots of nobles and commoners alike to protect the country that he loves. 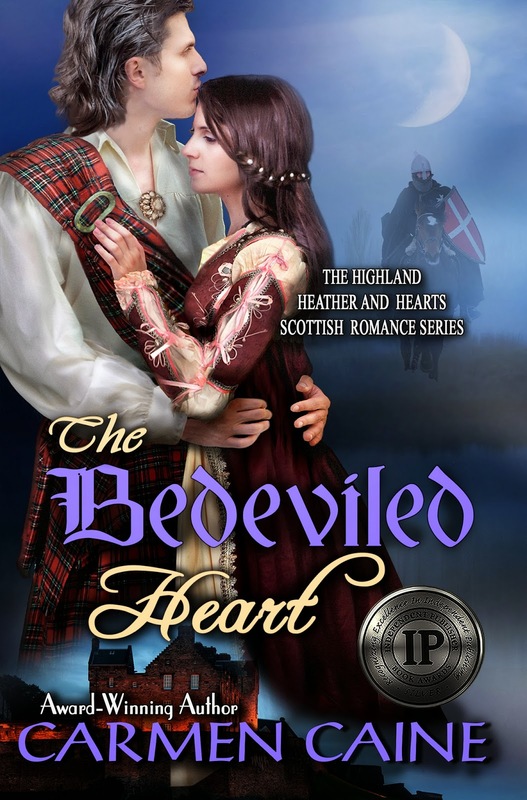 While each of these books is a standalone story, "The Bedeviled Heart" begins the tale of King James III of Scotland which is continued in "The Daring Heart" and finally ends with "The Bold Heart". I love, love, love the idea that this author incorporated real people into her historical romance. I think that made the book even more fun. Not only that, but Carmen Caine has the talent needed to write an awesome historical romance. The language and descriptions she uses are perfect. I can't say enough about this book. If you love historical romances, this is one you must read.